Richard Noble achieved the World Land Speed record of 633.468mph on Nevada's Black Rock Desert in October 1983. In October 1997 he achieved his life time ambition of leading the team that broke the speed of sound. Richard Noble's original record was the third longest standing Land Speed Record of all time. He conceived, planned and executed the project to build a 30,000 HP 650mph car from a zero cash base. He drove the car Thrust 2 at over 600mph 11 times and to a peak speed of 650.88 mph. For his achievement, he was given amongst other awards the OBE, the RAC Diamond Jubilee Trophy, the John Cobb Memorial Trophy, the Sir Malcolm Campbell Trophy and the Sir Henry Segrave Trophy. His most recent project has been the SSC Programme where he was Project Director . 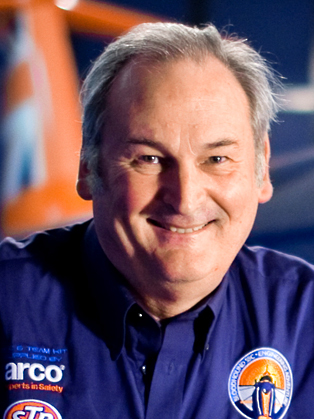 Richard Noble founded the SSC Programme Ltd with the objective of producing the first ever supersonic land speed record car against competition from both the USA and F1 MacLaren team. The project research was carried out in extreme secrecy and took 3 years and the test programme involved the first use of computational fluid dynamics on a car design which was validated with high speed rocket testing at Mach 1.2. Before this land speed record cars had been designed using windtunnels which gave uncertain results. By June 1995, the research demonstrated clearly that the project was possible and the project launch of the 100,000 HP ThrustSSC was held on June 3rd with startling media response. In October 1997 his life time ambition was realised. The project was the first to use end to end online trading in Britain and the global web following was 59 million visits in 1997. The current BloodhoundSSC programme is now creating the Worlds first Mach 1.4 car for operation in 2013/14 which is also being used asn an open data educational stimulant and is now being followed by 4800 schools in the UK and also in 213 countries . After 30 man years of advanced research the 135.000hp car is in build. Richard specializes in high technology high risk programmes and his earlier projects have included aircraft and ships – Bloodhound is his 12th start up . Funded by public support and sponsorships the projects use flat companies and specialize in innovation which attracts sponsorship funding. Successful innovation in Britain is incredibly difficult Richard's presentations are deeply thought provoking, are presented at a fast pace and feature amazing video inserts. The idea is to inspire the audience to realise that their true potential is likely to be way ahead of their current levels of personal ambition and to encourage original thought, action and to understand true teamwork. Richard's speaking engagements have been continuous since 1981 and take him all over the World – and wherever he is, there is always an audience fascinated with the achievements of the ThrustSSC team – and of course the current Bloodhound Project.